The EARLY BIRD rate has been extend­ed to April 30th for all OHS mem­bers. The 2019 con­ven­tion site is now avail­able. New mate­r­i­al is being added reg­u­lar­ly, and there will be forth­com­ing infor­ma­tion about the Hotel, Reg­is­tra­tion and Venues. Help sup­port oper­at­ing expens­es of OHS pro­grams and ser­vices. Vot­ing starts on Mon­day, April 15. Select the ​“Vote Now” but­ton below for more info! Please take the time to review the can­di­dates and their posi­tions on four ques­tions, avail­able here and in the April issue of The Track­er. Please con­sid­er the good works of the Soci­ety in edu­cat­ing, pre­serv­ing, and chron­i­cling a rich organ her­itage and cul­ture, and the impor­tance of sup­port­ing these efforts in your deci­sion to become a mem­ber. You will receive a sub­scrip­tion to our quar­ter­ly mag­a­zine, The Track­er, and all ben­e­fits of mem­ber­ship, includ­ing mem­bers’ prices on some items in the OHS Cat­a­log. Any time of year is a good time to join OHS! After a lengthy absence, the OHS cat­a­log store has re-opened. Bear with us as we wade our way through the inven­to­ry, replen­ish the hot tick­et items and fea­ture new, excit­ing prod­ucts. In addi­tion to the music, the CDs and the books, please check out the OHS cof­fee mugs, a brand new OHS lapel pin, and our awe­some Christ­mas orna­ments. Until June 30th, one dol­lar from every pur­chase will go to the E. Pow­er Big­gs Schol­ars fund. OHS has a supe­ri­or rela­tion­ship with many of the organ music pub­lish­ers includ­ing Hal Leonard. See some­thing on the Hal Leonard site? Let us know and we will get it for you. We will work hard to ful­fill your music pur­chas­ing needs. 484.488.PIPE (7473). Four foots and eight foots with no mix­tures but it works! OHS is delight­ed to wel­come the stu­dents and pro­fes­sors from three US insti­tu­tions of high­er learn­ing. Con­grat­u­la­tions to Cur­tis Insti­tute of Music in Philadel­phia, Syra­cuse Uni­ver­si­ty and Ari­zona State Uni­ver­si­ty. Thank you to Alan Mor­ri­son, Anne Laver and Kim­ber­ly Mar­shall for their lead­er­ship and tute­lage of the next gen­er­a­tion of organ­ists. Wel­come to the OHS fam­i­ly. Recital by John Walker at 7:30 p.m.
Gala Reception Following Benefits the AGO Endowment Fund. The 2019 Longwood Gardens International Organ Competition is open to organists between the ages of 18 and 30. The competition begins with a qualification round featuring applicants from around the world. An audition jury of six esteemed members of the organ community anonymously evaluates the competitors’ audition recordings and selects 10 of the world’s brightest young talents to compete live before a panel of renowned judges in a quest for the top prize. For more information regarding the Longwood Gardens International Organ Competition please email organcompetition@longwoodgardens.org or call 610-388-5457. OHS pub­lish­es its jour­nal four times a year. 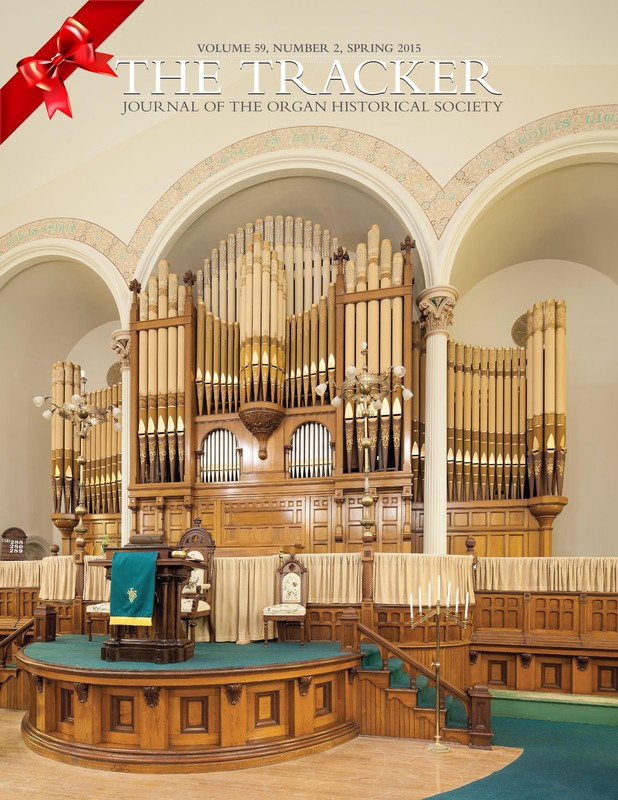 The Track­er includes news and arti­cles about the organ and its his­to­ry, organ­builders, exem­plary organs, region­al sur­veys of instru­ments, and the music played on the organ. The empha­sis is on Amer­i­can organ top­ics of the 18th, 19th, and 20th cen­turies, and there are occa­sion­al arti­cles on Euro­pean top­ics. Most issues run 48 pages with many illus­tra­tions and pho­tographs. Give A Gift Sub­scrip­tion Now! Think about the plea­sure you will receive in offer­ing an OHS mem­ber­ship to a friend or rel­a­tive. 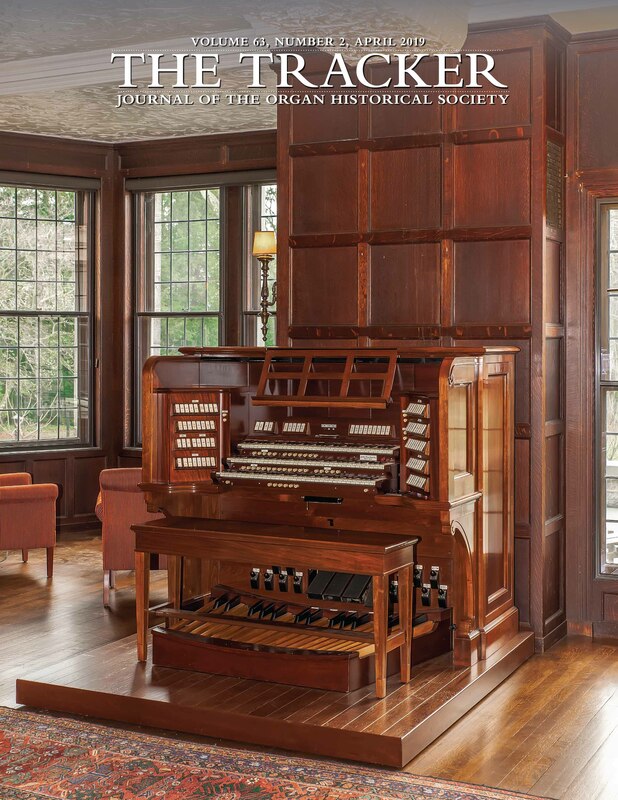 You can share your love of the pipe organ and intro­duce some­one else to the good works of the Soci­ety in edu­cat­ing, pre­serv­ing and chron­i­cling our rich organ her­itage and cul­ture. Mem­ber­ships make splen­did gifts. The recip­i­ent will receive a sub­scrip­tion to our quar­ter­ly mag­a­zine, The Track­er, a spe­cial gift and all the ben­e­fits of mem­ber­ship, includ­ing mem­bers’ prices on many items in the OHS Cat­a­log. EARLY BIRD REGISTRATION rate has been extended to April 30 for all OHS members. Plan to arrive on Sunday July 14th for the first event which begins at 4:30pm. The schedule of events provides an excellent blend of exciting instruments, engaging presentations, a hymn festival, and plenty of tasty food! You will want to stay for the extra day on Friday July 19th to hear the magnificent Casavant at Broadway Baptist Church, take a train ride and eat delicious barbecue. Register before April 30th to take advantage of the Early Bird rate. Register for the Dallas Convention Now!